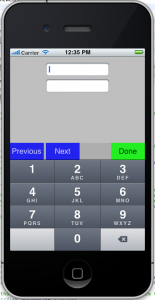 When building iPhone applications that support or provide text input, it’s often necessary to create some extra buttons (or other controls) beyond the ones provided by the default keyboard interface. Those buttons should be created for specific operations needed by your application, such as moving to the next or previous text field, make the keyboard disappear e.t.c. To understand what exactly this is all about, just see what’s happening when you are using the Safari browser and you type username/password values to login in your e-mail account. Just right above the keyboard, there are two buttons that allow you to move to the next or previous field and a third button that allows you to close the keyboard and see the whole browser again. 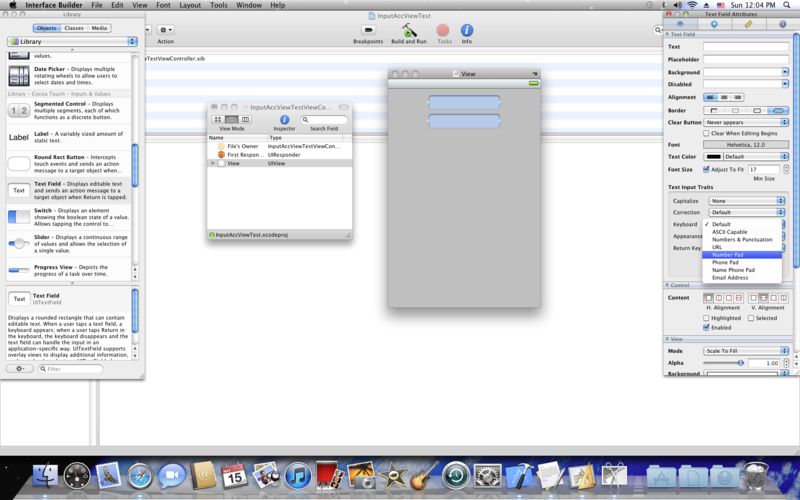 That area above the keyboard is an extra UIView, known as Input Accessory View. That view is supported by the UITextField and UITextView as well and is added to any control of that kind using the setInputAccessoryView method. But that’s the last step. 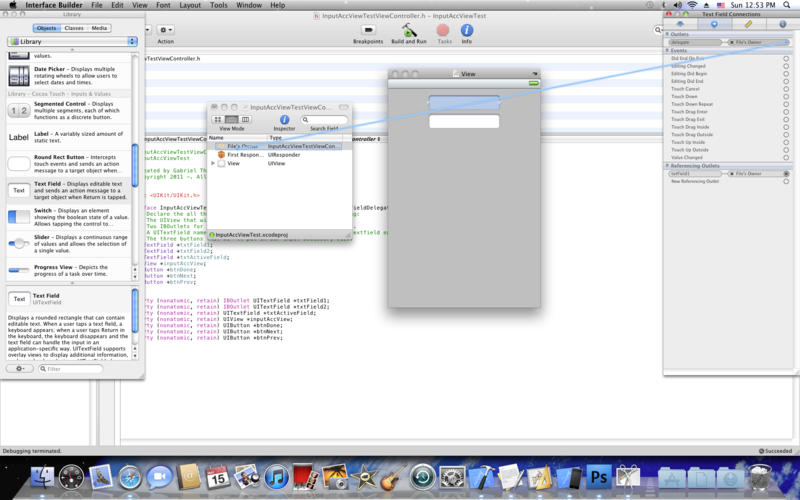 All the controls existing in the Input Accessory View must be created prior to adding the view to the textfield/textview. 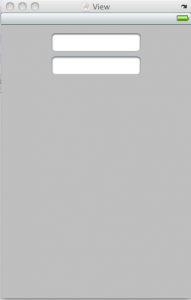 In this post I am going to show how to create an input accessory view programmatically. It’s supposed that you are already familiar writing code in the Xcode and have a basic knowledge on how to create UI controls and views manually. If you don’t, you’ ll learn now. In this example we will create only two UITextFields. We will set the keyboard to numpad so we won’ t have any way at all to close the keyboard view. All those will be done using the Interface Builder. 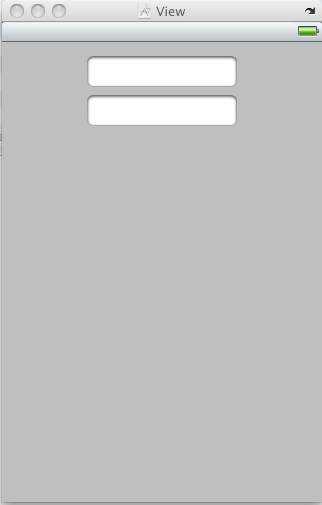 Then, programmatically we’ ll create two buttons to move between the fields and one more to close the keyboard view. We’ ll add these buttons to a UIView and set the view as our input accessory view that will appear every time that any of our two text fields get the focus (become first responder). After that select both of them and set the keyboard to numpad. // The UIView that will become our input accessory view. // Two IBOutlets for our text fields (the ones created in the IB). // A UITextField named txtActiveField which shows us the active textfield each time. // The three buttons that we’ ll put in our input accessory view. Go to the IB and connect the outlets to the UITextFields you created earlier. // Create the view that will play the part of the input accessory view. // Set the view’s background color. We’ ll set it here to gray. Use any color you want. // you can leave it unchanged. // If you want you may set or change more properties (ex. Font, background image,e.t.c.). // For now, what we’ ve already done is just enough. // Let’s create our buttons now. First the previous button. // Set the button’ s frame. We will set their widths to 80px and height to 40px. // You can set more properties if you need to. // (as well as the methods for the rest of our buttons) later. // Do the same for the two buttons left. // Now that our buttons are ready we just have to add them to our view. That method will create the buttons we need and prepare the inputAccView view. Now implement the UITextField’s delegate method textFieldDidBeginEditing. By using that method, we’ll know when a textfield becomes first responder (gains the focus), so we can attach the input accessory view. // Call the createInputAccessoryView method we created earlier. // By doing that we will prepare the inputAccView. // Now add the view as an input accessory view to the selected textfield. Note the txtActiveField. In that object is stored the selected UITextField every time it has the focus. That field will be used next and will help us to distinct which field is selected and how to move between them. // field so just return. // app it's possible that you'll have more than two textfields. // If the active textfield is the second one, there is no next so just return. // Make the second textfield our first responder. // When the "done" button is tapped, the keyboard should go away. // That simply means that we just have to resign our first responder. Please note that the buttons in this example are quite simple and of course in a real application you should take care of creating beautiful ones, using images or nice colors. That’s up to your imagination. It would be a good idea to use background images for both normal and highlighted state for your buttons if you want to achieve the “animation” that simulates the finger tap. That’s all for the time being. There are more posts that will come (hopefully) soon. In any case, don’t hesitate to experiment with everything that I mentioned in this post. I hope it will be useful. Have a nice iPhone programming day.